Ask any child about deer and “Bambi,” the fawn1 in Walt Disney’s beloved animated movie of the same name, will inevitably come up. Bambi and his family lived way out in the wild, but many real-life fawns and their families have become urbanites. The ‘wild” is getting smaller and all it takes is a neighborhood with 20 acres or more that offers what they need for survival. As human development unceasingly squeezes deer habitat, they sometimes have no better place to go. Do they visit your backyard? Here’s their story. White-tailed Deer, Odocoileus virginianus, are mammals in the order Artiodactyla (ART-ee-oh-DACK-tuh-luh, which means even-toed animals) and the family Cervidae (SER-vuh-dee), which includes Moose, Elk, reindeer (known as Caribou in North America), and others. Their genus is Odocoileus, which is from the Greek for “hollow tooth.” And, the word “deer” is from Old English dor, meaning “beast.” Like “Moose” and “Sheep,” deer is both singular and plural. White-tailed Deer, or Whitetails, are a group of subspecies native to the Americas. Taxonomists don’t agree on just how many there are, but somewhere between thirty and forty. They have no close relatives anywhere else in the world. Thirty million live in the continental United States, except California, and most heavily east of the Rocky Mountains. The subspecies inhabiting your area may be different from those living just a state or two away. 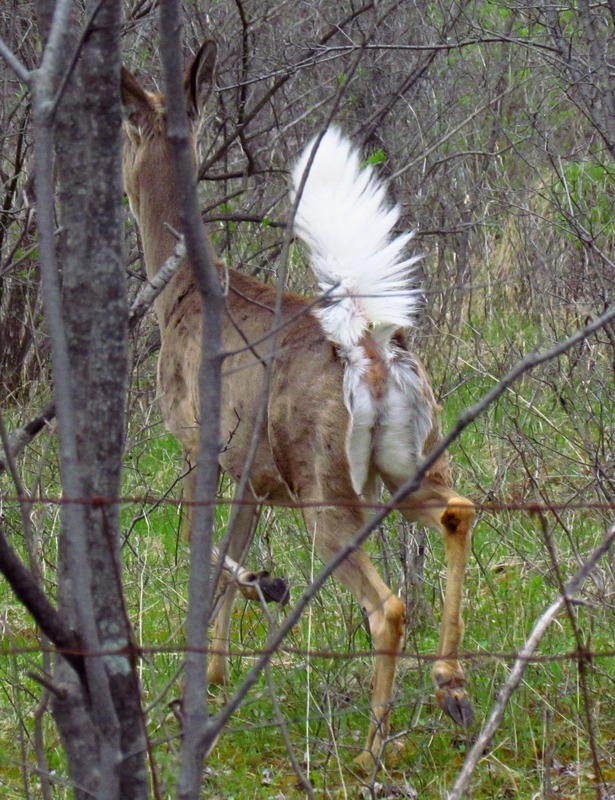 Whitetailtails were introduced into localized areas of Europe in the mid-1800s. Whitetails evolved over millennia from small, antler-less, tropical herbivores to the graceful animals we see today. Fossil DNA shows they date back to the mid-Pliocene Epoch. 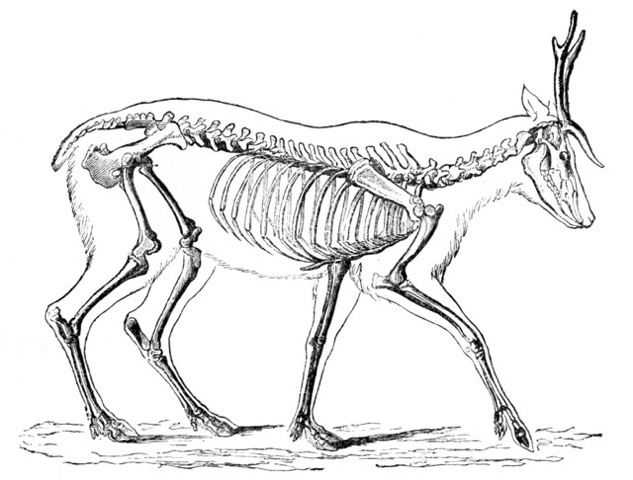 That was between 5.33 million and 1.81 million years ago—a time of global cooling which led to the spread of grasslands that, in turn, created suitable deer habitat. They began to radiate northward from the tropics of Central and South America, and by the Pleistocene Epoch, 1.8 million to 10,000 years ago, they were common in eastern and central NA. Males are called bucks and females are does (DOZE). You may know the term “stag” for male deer, and that isn’t incorrect, but it’s more commonly used for larger members of the Cervidae family, like Moose or Caribou males. White-tailed Deer are named for their tail, which appears to be brownish with a rather unimpressive white fringe. That is until they raise it. When it flips up and curls forward, a bright, broad underside of white hair is exposed. As for the rest of their hair, in summer, it’s reddish-brown and relatively short, with a thin, wiry texture. It turns grayish in winter, with long guard hairs and a thick undercoat to provide insulation. The hair of those living in northern regions has hollow shafts that fill with air and add to its insulative value. In general, their body size varies according to their locale–the farther they live from the Equator, the larger they are. If you’ve never seen a Whitetail up close, you may be surprised when you do, because all are much smaller than you may think. Their shoulder height ranges from 21 to 47 inches (53 cm to 120 cm)–about the height of a six-year-old child. Males are taller than females. Body length runs from about 37 to 87 inches (94 to 221 cm), including a tail of about 3.9 to 14.6 inches (10 to 37 cm). As for weight, rarely a male might weigh up to 300 pounds or more (136 kg) but typically no more than 100 to 150 pounds (45 to 68 kg). Two examples of size variance are the South American White-tailed Deer, Odocoileus virginianus cariacou, found in Peru and Brazil, that stands only 24–32 inches (61-81 cm) at the shoulder and the Dakota White-tailed Deer, Odocoileus virginianus dacotensis, of the US, which is 31 to 41 inches (79 to 104 cm). 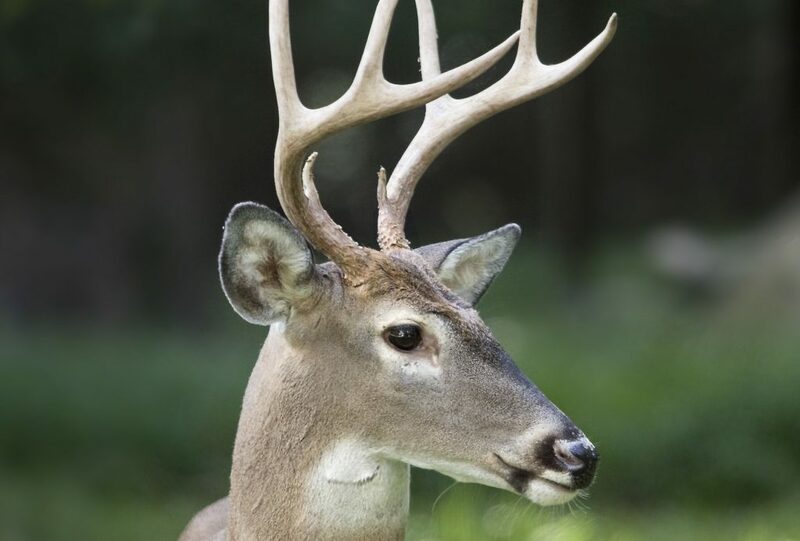 The Whitetail’s ears are large, upright and 5–12 inches long (13–30 cm). They have 32 teeth, but no front teeth in their upper jaw. Instead, there’s a tough pad that’s used to help the lower front teeth hold food in place. Their legs are perfectly designed to escape predators. They’re long and slender with powerful muscles and agility that can swiftly turn and pivot. The back legs offer strength for leaping—up to 10 feet high (3 m) or 30 feet forward (9 m) in a single bound—and they can gallop at 35 miles per hour (56 kph). The deer are also exceptional swimmers and can paddle at 13 miles per hour (21 kph). Deer have “cloven” hooves, which means they’re split into two toes. There are two other toes, called dewclaws, located higher up on the leg. They’re similar in structure to the hooves, but smaller, and don’t touch the ground, except when the deer runs, jumps or is on a soft surface. The surface of the hoof is hard and made of keratin, the same protein that forms our fingernails. Whitetails have excellent vision, smell, and hearing. Their eyes have superb peripheral sight because they’re located at the sides of the head; they can see almost all the way around their body. Also, they have more light-detecting cells than humans have, which enable keen night vision. That’s impressive, but smell—ten thousand times better than a human’s—and hearing–which can detect the softest sounds–outweigh their eyesight. It’s commonly assumed that “antler” and “horn” are two names for the same thing, but there’s a difference. Antlers come in pairs, they’re branched, and protrude from the front of the deer’s skull. Horns project from the front, too, but they’re permanent and don’t branch. Antlers primarily grow on males (although about one in ten thousand females also has antlers). They start in the spring when more extended daylight hours increase the male’s testosterone level, which ignites their growth. They begin as two bumps, or “buds,” on the forehead, one a few inches above each eye. Called pedicles, they’re covered with skin and hair and made of spongy bone. (Male fawns begin to grow them at only a couple of months old.) Within a month the first tine, or “point,” begins to form. The antlers grow fast—up to 2 inches (2.5 cm) or more per week—and in about four months they’re fully developed. Each antler has a main beam that first grows slightly in a backward direction, then reverses and curves forward and over the face. Each main beam holds from one to several un-branched tines. Antler width, or “spread,” is calculated by the widest inside distance between the main beams. For White-tails, spread may range anywhere from 3–25 inches (8–64 cm). Antlers are usually symmetrical, but asymmetrical pairs also occur, with tines growing in every direction. While the antlers are growing, they’re covered in a soft, velvety-looking skin tissue that’s filled with a rich supply of blood vessels and nerves. By late summer decreasing day length signals the testosterone level to drop, and the blood supply turns off. The velvet, now starved of blood, dries up and falls off, often in just a day or two. Males rub their antlers against trees during this time, which clears off the velvet and, incidentally, polishes them to a lustrous shine. Males use their now-hardened antlers for combat displays of strength and dominance during the breeding season. The sound of antlers colliding can often be heard over long distances, and it sometimes attracts females in heat. After the season ends, antlers drop off, or “shed.” That leaves an open wound, which covers over with skin. Come next spring, the process starts again. The older a buck, the larger his antlers. At one-and-a-half years old, they average four tines, while at three-and-a-half years and older, they average eight tines. After about seven-and-a-half years the antler size declines. It seems like this would be an excellent way to judge an individual buck’s general age. But, not so, say the experts—genes and injury influence antler growth, as do any nutritional deficiencies in calcium, protein, phosphorus or other vitamins. So, what method do they use? They check a deer’s teeth. It so happens that fawns have baby teeth, just like humans do—they’re born with four, and in a few months will grow baby incisors and premolars. By about eighteen months the baby teeth have been replaced with permanent adult teeth. After that, the amount of wear on the molars is used to establish the animal’s age—teeth lose about 0.04-inch of height (1.06 mm) above the gum line each year. Deer partly chew their food and swallow it, where it passes into the first two chambers of the stomach, the rumen (ROO-men) and reticulum (ruh-TIC-u-lum), which perform the same function. The food moves back and forth between the two (collectively called the reticulorumen), mixes with saliva and breaks down into solids and liquids. The solid material clumps together and gets regurgitated. 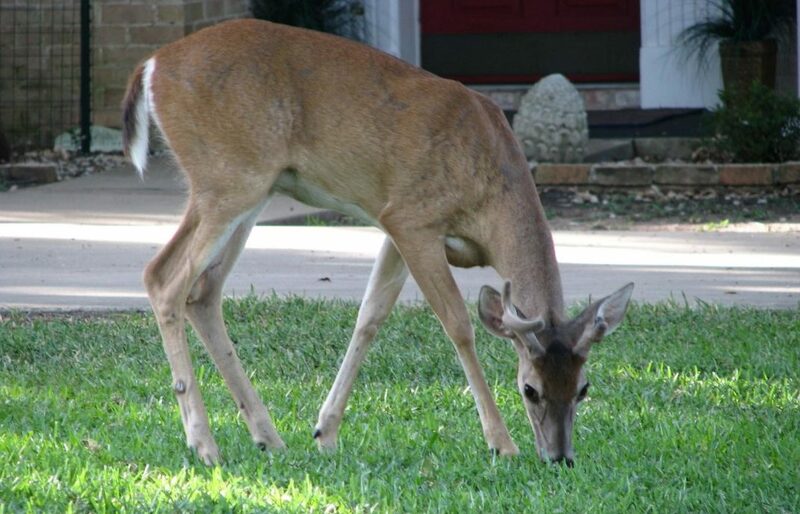 Deer slowly ruminate (chew) the material (cud) to mix it with more saliva and break it down into even smaller particles. Depending on how much fiber is in the food, they may spend several hours a day chewing their cud. Once swallowed again, the cud passes through the reticulorumen into the omasum (oh-MAY-sum), where many of the mineral elements are absorbed into the bloodstream. 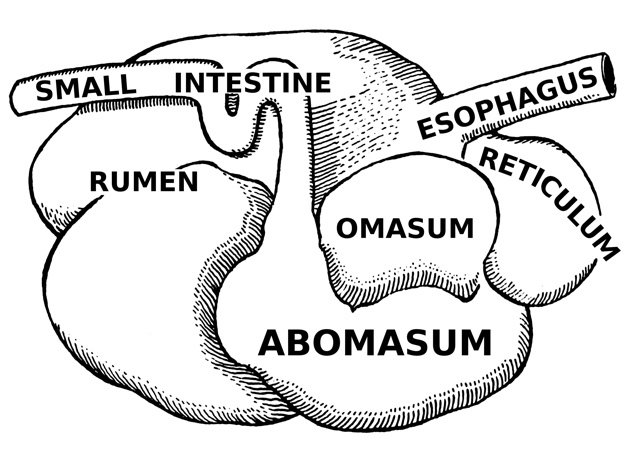 From there the mixture moves into the abomasum (AB-oh-MACE-um), which is equivalent to a human stomach, and from there into the small intestine. All four chambers contain vast populations of various bacteria and other microbes that break down and ferment the food material. So, there you have it! 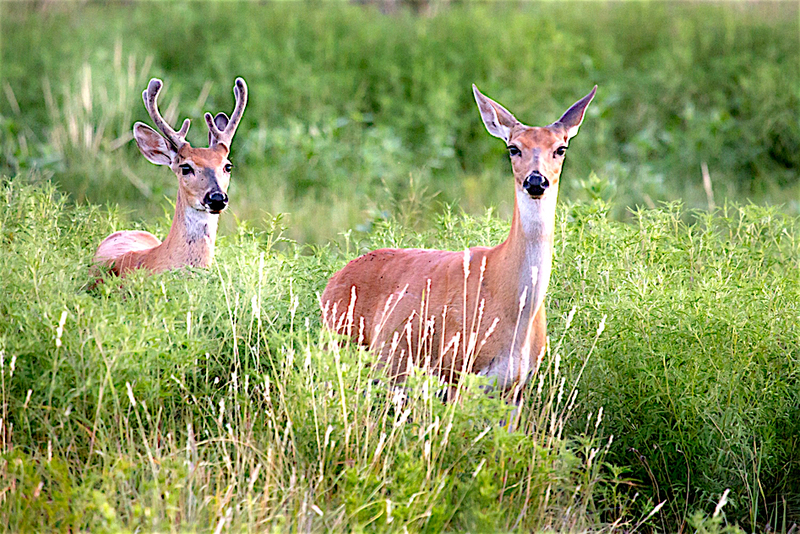 The deer like to rest in “deer beds,” which are oval depressions in leaves, soft dirt or grasses. The beds are always surrounded by shrubs and grasses to shield them from prying eyes and lousy weather. They’re hard to spot. They rarely bed in the same spot twice, a tactic that probably protects them from predators. The deer have several ways of communicating with each other. For example, males strip the bark off of small trees to mark their territory. Like nearly everything else, there’s a name for that mark, it’s called a “rub.” They also make scrape lines with their front hooves to expose bare ground in their territory. Deer also communicate with scent glands that secrete fatty lipids. They’re located between the split toes on their hooves, on each leg, between the eyes, at the base of each antler, and other places. The secretions convey many messages. They send a signal every time a deer rubs trees or shrubs. The glands on their hooves leave a scent on the ground with every step they take. They stomp their feet when they’re alarmed, which deposits an excessive amount of scent as a warning to others. Their scent alerts females when males are moving through the area, and it also lets males know when competitors are around. And, deer vocalize. Not a lot, but thirteen different calls have been identified. For example, one particular call is used by females to locate other members of their family group. Mothers have a call for their fawns. Females have a call that announces when they’re ready to mate. Bucks have several calls, too. You can hear several different deer sounds here. Males and females typically reach sexual maturity at about eighteen months of age. Breeding season seems to be timed to occur about six and a half months before the best fawning period for a particular locale. Commonly called rutting season, it may occur anytime from late-September through January. 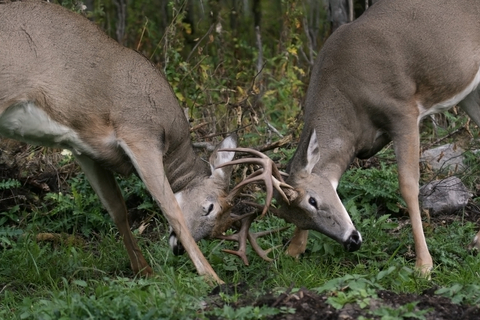 Males spar with each other to win the rank of top deer. Sparring consists of ramming into each other, clicking antlers, trying to push each other backward, kicking, and flailing their legs. The reward is the first choice of females. A male follows a female for a few days before mating. They mate several times. He hangs around for a few more days to keep other bucks away, then goes off to mate with several other females. He won’t be involved with females again until the next mating season. The gestation period is about 200 days. Females usually give birth to only one fawn the first time. After that, they typically have twins or, rarely, triplets. The fawns are born quickly, sometimes with the mother standing. Newborns weigh 5–8 pounds (2.3–3.6 kg). Their eyes are open, and they can stand and walk within an hour or two. Their first nursing provides a high-protein milk called colostrum, which contains an assortment of antibodies that will help the fawns resist disease until their own immune system is developed. 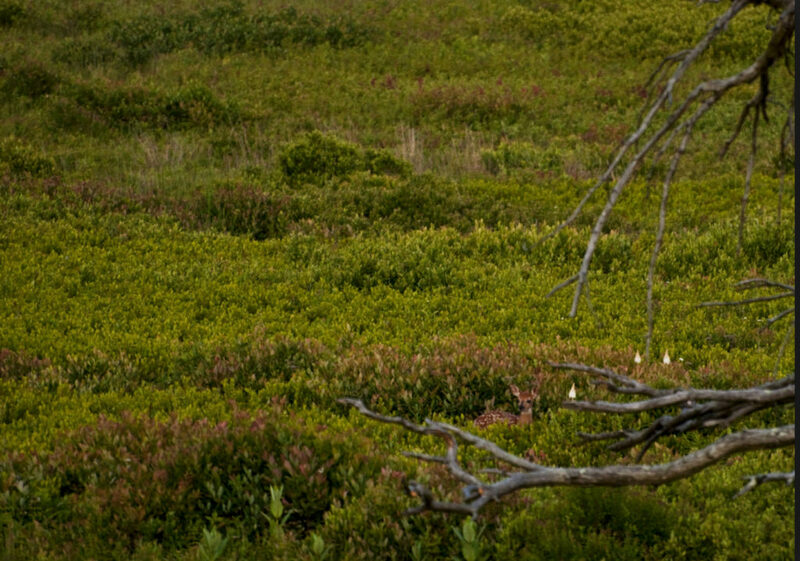 The mother hides her fawns in dense vegetation to protect them from predators and stays away from them. She returns only two or three times a day to nurse them. While they wait, fawns tuck their legs, head, and neck into their body for maximum concealment. They lie motionless when a predator is nearby. Their coat is reddish-brown with white spots, which is a perfect camouflage in the dappled sunlight striking a forest floor. Even out in the open, it’s hard for predators to see them. 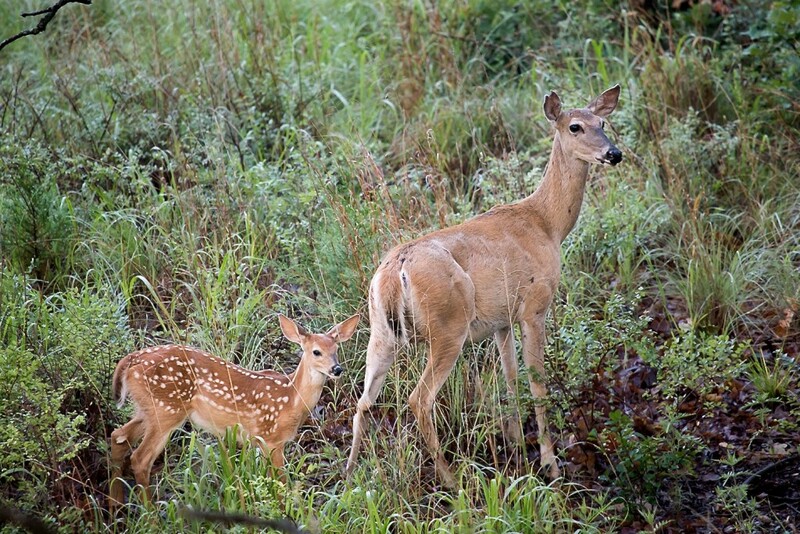 Fawns can’t be smelled, either, as they have no body odor and hold their urine and feces until their mother returns. When she does, she ingests whatever the fawns eliminate, which removes any tell-tale odors. Fawns munch on vegetation as early as a week or so old. At about one month, they start accompanying their mother. Should a predator approach, the mother will show herself and run off in another direction, hoping to lure it away. Fawns are playful and spend time frolicking, nudging, jumping and boxing one another with their legs and feet. They’re weaned at eight to twelve weeks and will sport their characteristic white spots for three or four months until their winter coat grows in. Female offspring remain in the same general area as their mother throughout their lives. Males leave in the fall, or by the next spring—if they don’t, the females will force them away. They might have to travel long distances to find new territories. Life expectancy can be up to ten years in the wild, but males typically live no more than two or three years and females five to six years. 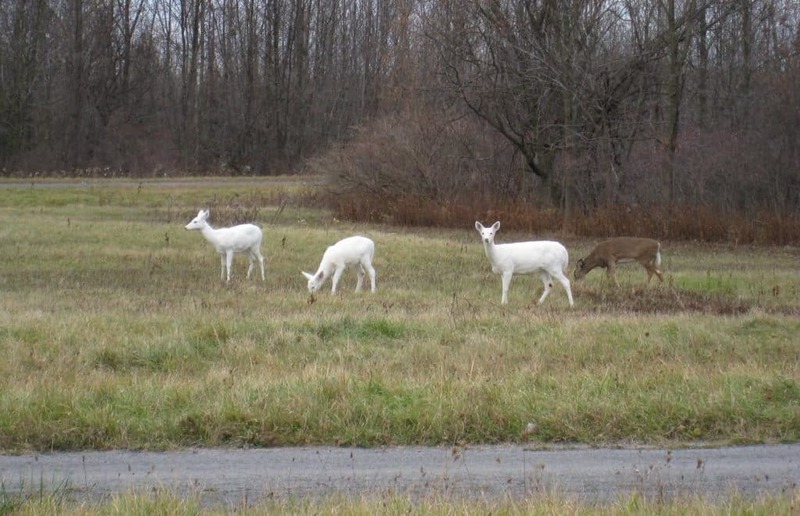 In captivity, a White-tail can live up to twenty years. The perfect habitat for White-tails is an area of one or two miles composed of a mixture of trees, shrubs, vines, flowering plants, grasses, and other plants, such as fungi. They need water, too, of course. That’s the ideal, but where forced to, they’re able to adapt to different environments, including forests, farmland, brushy areas, even shrubby deserts, and from sea level to mountain ranges. Fields and meadows appeal to Whitetails in the summer, along with nearby deciduous and coniferous forests for shade. In winter, the forests offer some protection from harsh weather, too. In agricultural areas, they stay within a forested area until evening, then move out to feed in the fields. On the Plains, which are wide-open and scantily dotted with areas of cover, they travel along grassy gullies and draws that offer them some cover. Some Whitetails live year-round in swamps, which provide them with water, many species of trees that drop nuts or offer good wood for browsing, soft bedding and cover for hiding and some safety from hunters. Their diet is based on the plants available to them, but soft-stemmed, broad-leaved, flowering plants are their favorite foods. In a forest, they might feed on undergrowth and fungi. In agricultural areas, they eat such crops as corn and alfalfa, while in the city their diet might consist of shrubs, fruits, nuts, vegetables, and flowering plants. Whitetails are intensely alert to everything going on around them. They’re agile and fast. They often enter streams and lakes to escape predators. But life is perilous. Coyotes, Cougars, Bobcats, wolves and wild dogs prey on them. Humans, though, are the primary predators of adults—hunters kill an estimated six million a year. In some states, they take up to eighty percent of the antlered deer each year. Two million Whitetails are killed by motor vehicles every year. Forty to fifty percent of fawns don’t make it to adulthood. 1In the book, Bambi, a Life in the Woods, by Felix Salton, published in Austria in 1923, the fawn is a roe deer. In the Disney 1942 animated movie, Bambi is a mule deer. **The fawn is in the lower right quadrant of the image, lying down.